If you’ve been watching the 2014 Winter Olympics from Sochi, Russia, you may have heard the commentators complain about the weather being too warm for winter sports. Reaching temperatures above 60° Fahrenheit (16° Celsius), there have been issues with many of the winter sports that are held outside, such as skiing and snowboarding to name a few. 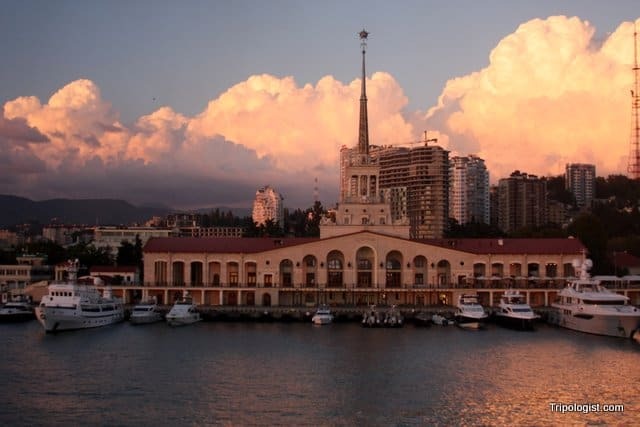 However, the presence of spring-like weather really shouldn’t shock anyone, as Sochi is one of Russia’s southernmost cities, with a climate more similar to the southern US than Siberia. While the winter months can bring cold weather and snow, especially in the nearby Caucasus Mountains, Sochi is more known to Russians as a top beach destination, having been a favorite of leaders like Joseph Stalin and Vladimir Putin. 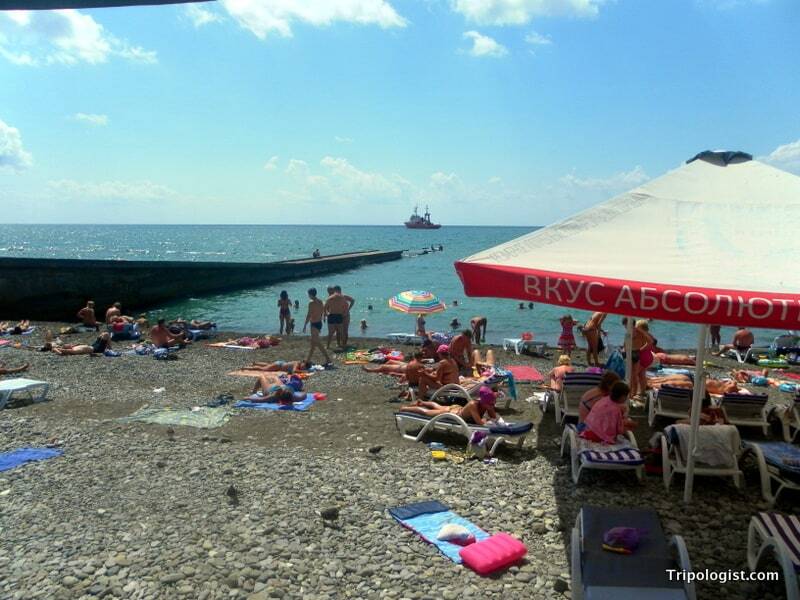 Often called the “Russian Riviera”, Sochi is in many ways like a stereotypical American beach town with a boardwalk runing along the popular beaches. 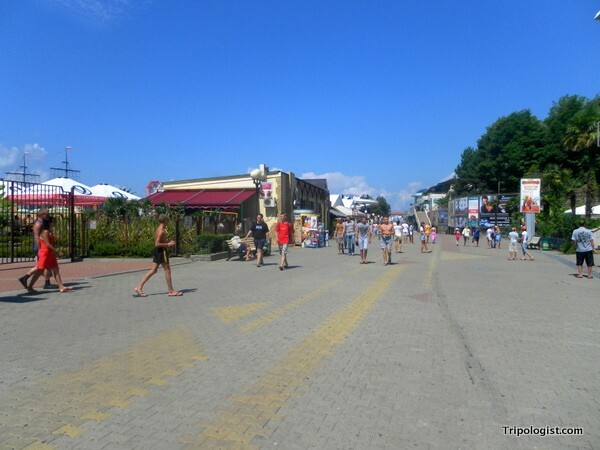 Along the boardwalk are tacky souvenir shops, overpriced restaurants, and a few cheesy amusement attractions. There’s even a small water park that teams with Russians on vacation during the summer months. The beaches themselves are nothing spectacular, but the calm waters of the Black Sea are popular for swimmers ad always attract a large crowd. Moving inland a bit from the beach area, Sochi’s downtown is quite pretty, with palm tree-lined streets fronted by buildings that wouldn’t seem out of place in New Orleans. When I visited in August 2012, there was a lot of construction going on, but there were still many hotels that dotted the landscape. 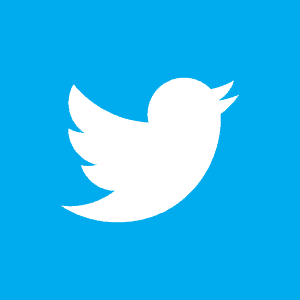 While they may have had a few peculiarities, there certainly weren’t any of the issues that made the hash tag “#sochiproblems” so popular on Twitter. 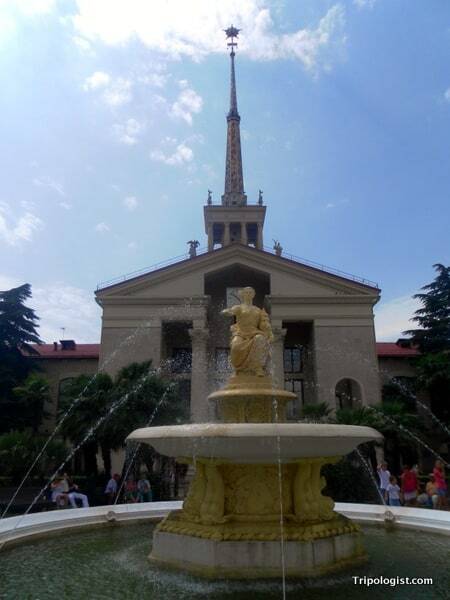 Overall, Sochi is a very pleasing town to visit. 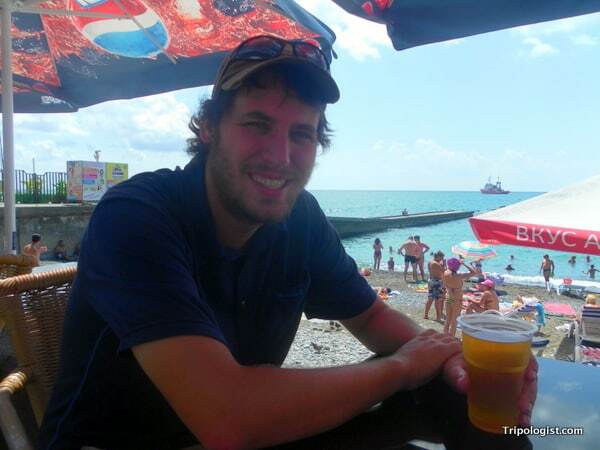 While we in the West often have certain preconceived notions about Russians, a visit to Sochi proves that Russians have the ability to relax and have fun when they want to. 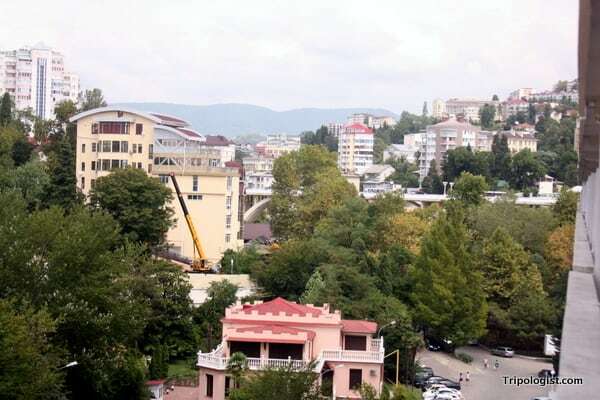 Sochi is also a great place to jump off for an overland journey to or from Turkey. Scroll down to see some of my favorite pictures from my time in Sochi. While it may be a bit out of the way and a bit challenging for travelers, it’s certainly a unique destination that is sure to attract attention for many years to come. 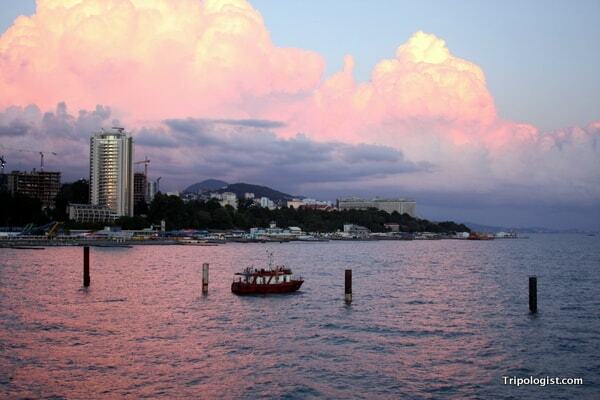 The port of Sochi, Russia, as seen from the top deck of a ferry at sunset. Overlooking Sochi from the balcony of my hotel. 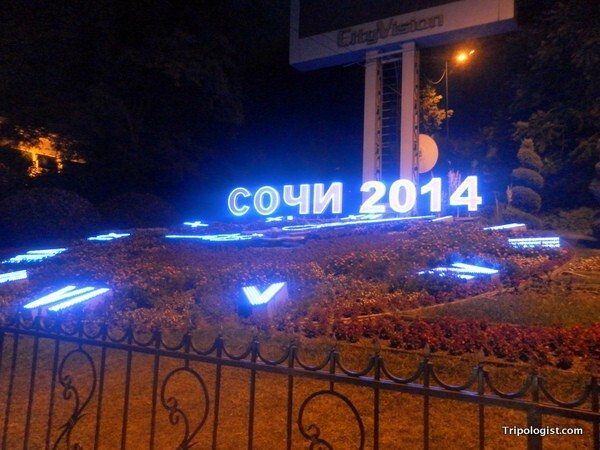 A lit clock that reads “Sochi 2014”. Looking out along the beautiful Black Sea beaches of Sochi, Russia (Notice all the construction cranes in the top left). 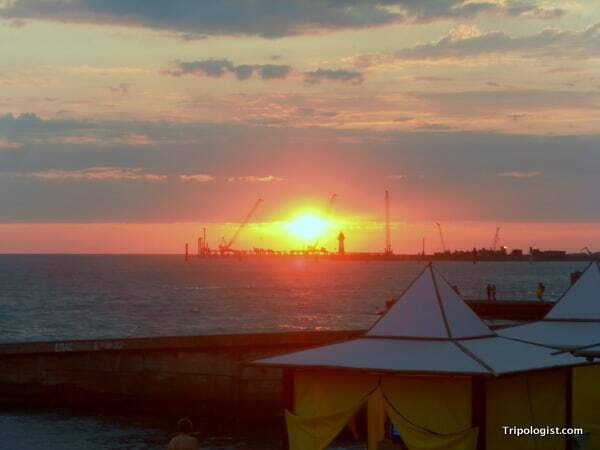 A beautiful sunset over the Black Sea. 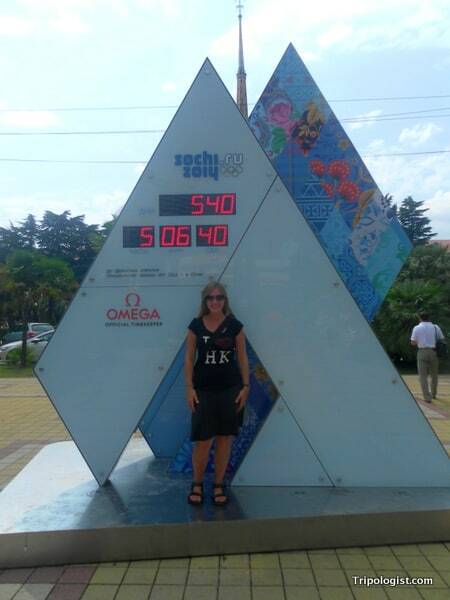 My wife posing in front of a sign counting down to the 2014 Winter Olympics. 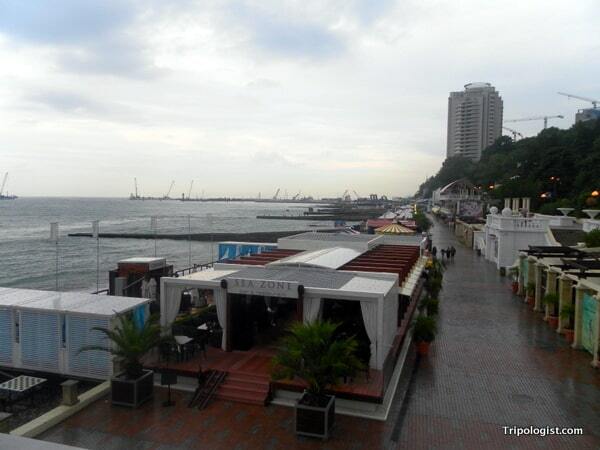 The boardwalk in Sochi, Russia after a brief rainstorm. Nice read and great pictures. I just left Sochi after a few days of Olympic fun and have mixed feelings about the place. I tried not to let the bad media reports get to me and went there with an open mind. I can see that it has potential but there was so many signs that it has been neglected for decades. Did you take the train to Adler? Miles upon miles of ruined buildings. I know that they are hoping to turn things around with the boost from the games. Hopefully they do. I’m quite jealous you went to the Olympics. I would love to go to one someday. 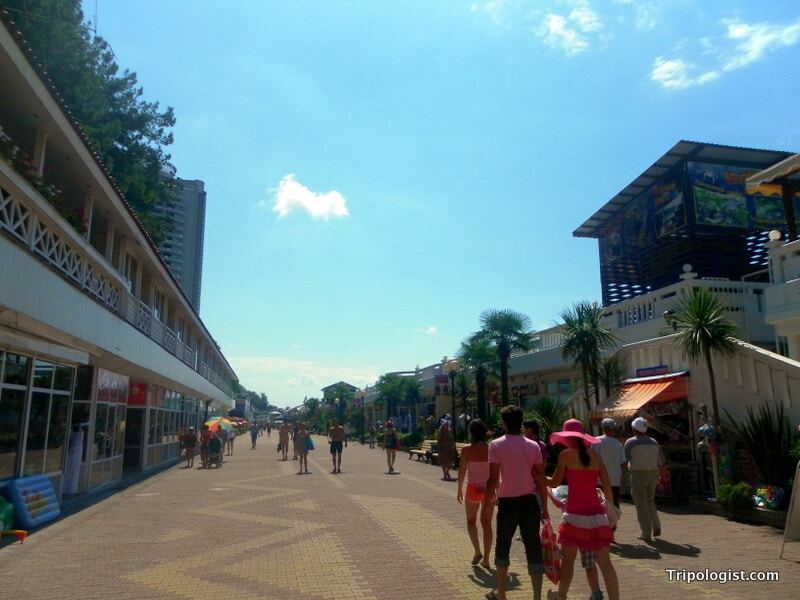 When I visited, I only went as far as downtown Sochi, which was about 20 minutes short of Adler. At the time, there was little out that way to see or do since the Olympic grounds were still a major construction site. From what I’ve heard, downtown Sochi is much nicer than Adler. It is great that the two of you managed to visit Sochi and see the attractions of the city before the on rush of the Winter Olympics. I dare say many people like myself new next to nothing about the place before now. 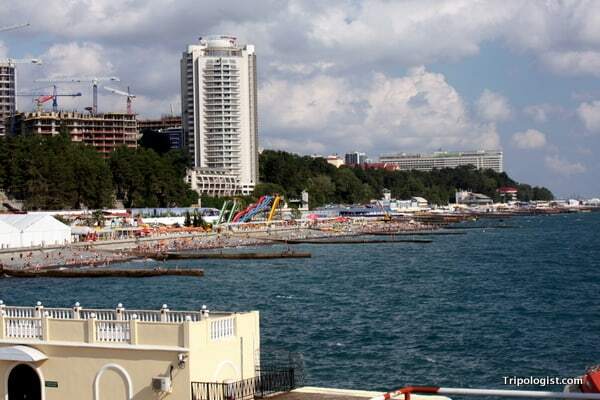 I wonder if the lasting legacy for Sochi will be foreign tourists; you certainly found the place to be of interest. It will be interesting to see the effect on tourism, and with some World Cup games being held there in 2018, Sochi will again be in the spotlight before too long. 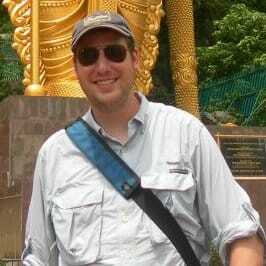 However, given its distance from other major cities, I doubt many foreign tourists will make the trek.